Because it's 2016, and every female needs access to feminine hygiene products. Ladies, what if not having access to sanitary pads or tampons meant that you had to miss out on your education, social life, and you found yourself in isolation for days while you were on your period? What if you had to use leaves, newspaper, mattress stuffing — anything you could find to stuff into your underwear — just to try and make it to school, but you still end up missing it? This is the struggle that millions of girls all over the world face while on their periods. This is simply because they don't have what they need to manage their periods. The lack of feminine hygiene products is prevalent for so many, but every day we take it for granted. It's definitely something to think about, isn't it? So there's this really awesome organization that exists that provides these types of things to girls in need around the world. What's the name of this organization you ask? So what does Days for Girls do? If you haven't heard of it already, Days for Girls is a non-profit organization that provides sustainable feminine hygiene kits to girls throughout the world. They provide education about reproductive health awareness and advocate social change by giving each community that they encounter a chance to thrive by contributing to their own community's betterment. These hygiene kits are culturally, physically and environmentally friendly too! Are you confused yet? Don't worry, the term "sustainable feminine hygiene kit" can be simplified! 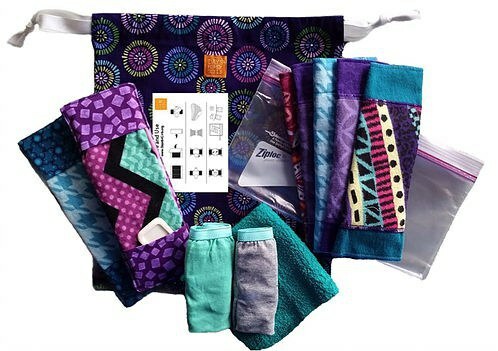 Basically, these kits consist of two pairs of underwear, a washcloth, a travel sized soap bar, two gallon-sized Ziploc bags, eight flannel tri-fold liners, two moisture barrier shields which snap into the underwear, and a visual instruction sheet. This is all put into a drawstring bag so the girls can take it to school with them, and it's all so cute! How convenient! All of the material in these kits are washable and durable and built to last three years. That gives up to 180 days of education, health and safety back to girls that they missed out on because they simply didn't have access to sanitary pads before. Just think of the effect this has on the girls and women that receive these kits! They are able to go to school year-round and just with this, so many more opportunities arise for their futures. Education and sanitary products are what we have constant access to, and we often don't think of the effect it has on those who miss out on them. When I found out about this organization I knew I had to get involved; it is now our top service project for the global scholars group that I am a part of at my university, which focuses on global health. We are about to send 200 kits to Tanzania and I couldn't be any more excited! It genuinely makes my heart happy to know how many lives I'm about to change. If you want to learn more about Days for Girls, check out their website. It's a great opportunity to become involved!